5 posts categorized "UEPI News"
Robert Gottlieb’s Reinventing Los Angeles has won the “Californiana” category of the California Book Awards given by the Commonwealth Club. The Commonwealth Club, based in San Francisco, calls itself “the nation’s oldest and largest public affairs forum”. The book awards were established in 1931 and are credited with having “discovered” John Steinbeck and other now-famous authors. The award will be presented on June 5th. The Center for Community Action & Environmental Justice recently awarded Professor Robert Gottlieb with the Dr. Zweig Health Advocate Award in the Academic category. The awards were given at the organizations 30th Year Anniversary on December 6th. 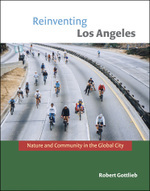 Robert Gottlieb's latest book, Reinventing Los Angeles, is now available from most online retailers. In it, Gottlieb traces the emergence of Los Angeles as a global city in the twentieth century and describes its continuing evolution today. He examines the powerful influences of immigration and economic globalization as they intersect with changes in the politics of water, transportation, and land use, and illustrates each of these core concerns with an account of grass roots and activist responses: efforts to reenvision the concrete-bound, fenced-off Los Angeles River as a natural resource; "Arroyofest," the closing of the Pasadena Freeway for a Sunday of walking and bike riding; and immigrants’ initiatives to create urban gardens and connect with their countries of origin.